There are endless sources of information on what to wear for a presentation, but it’s a question I’m often asked. And it’s getting more complicated all the time as the workplace becomes more and more casual. Like it or not, audiences are making all kinds of conscious and unconscious judgments about you before you even utter your first word. They’re looking for clues about whether you’re worth their attention, and most of those clues come from your appearance — your posture, your gait, your hair and, yes, your wardrobe. So it’s really important that you set the right tone from the start, and wear clothes that make a strong first impression or, at minimum, don’t undermine you. 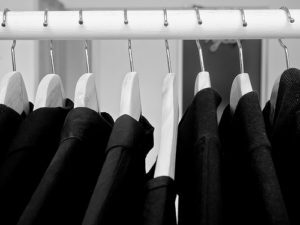 Here are my tips on common wardrobe pitfalls and how to avoid them..
First and foremost, wear something that makes you feel great. I have this one shirt (see photo) that I absolutely love. It fits exactly right, looks sharp and holds up well after a long day at a conference or traveling. So I end up wearing it a lot. Most of us have a go-to outfit or article of clothing like this in our closet. Choose that and you’re much more likely to feel poised and confident in front of an audience. Of course, there are reasonable limits to Rule 1. If your “feel good” clothes are the ones you wear to mow the lawn or go to the gym, that’s obviously not going to work for a big presentation. The traditional rule of thumb is that you should dress one level above your audience. In the business casual era, that’s getting harder to figure out, but the general principle is, if your audience is wearing sport coats, you wear a suit, if they’re in khakis and button downs you put on a sport coat, etc. And I apologize. I know these examples are completely male-centric, but that’s what I happen to be. If you’re looking for advice specific to women, there are people (women) to consult who are more qualified than I am to weigh in on this. The bottom line is, your wardrobe should help you project authority. You should look like you belong up there sharing knowledge with a group. So whatever level of dress you wear, from a t-shirt to suit, it should be high quality, well tailored and contemporary. So you want to look to your audience for context. The tech industry is a widely cited example — show up at a conference of developers in a suit and tie and you’ll be written off as old-fashioned and out of touch. But you never know. I have one client whose people all wore suits and ties to my workshops; on the other hand, I spoke to a bunch of lawyers who were dressed in jeans. The smart thing to do is to check with the organizers in advance and to dress with flexibility in mind so you can change things up on-site (add a tie or shed a jacket, for instance). Your clothes should match who you are. A zany creative type will probably dress in an edgy or avante garde way. A risk management consultant would look more at home in a conservative suit. It all depends on where you “belong” — in the boardroom or the backroom. Also, a suit and tie doesn’t have to be stodgy. A trendy outfit — slim pants, fitted jacket, narrow tie, spread collar — makes a statement of its own. Always road test your outfits before wearing them on stage. Standing in the spotlight in front of several hundred people is a terrible time to find out that your shirt has an annoying tag that chafes your neck or your pants get easily wrinkled or your fabric is more sheer than you expected. Invest in high quality, fashionable jeans tailored to your physique. The cool factor you’re going for will be totally undermined by “dad (or mom) jeans,” baggy, slouchy jeans, or the kind of jeans you’d wear to mow the lawn. Make sure you wear a blazer or sport coat that pairs well with jeans. I see a lot of guys throw on what is very obviously a suit jacket over jeans and that is wrong, wrong, wrong. Read up on the important difference between suits, sport coats and blazers. If you must wear a t-shirt (as opposed to, say, a button down), make sure it’s a nice one that fits well and isn’t all stretched out or faded. And if the label says “Hanes” or “Jockey” what you have is an undershirt. If the audience’s main takeaway is remembering what you wore, you’re doing it wrong. Unless you have a certain brand that calls for bright red pants or a hat with a giant yellow feather, it’s best to dress simply. Avoid colors or accessories or jewelry that might distract the audience, make noise or cause a glare under stage lights. The best placement for a lavalier (clip-on) microphone is centered on your upper chest. People often clip them to a lapel, but that’s a bad idea because every time you turn your head, the sound level will change. The ideal thing to wear to accommodate a lavalier is a button down shirt (it should go near the second button) or a necktie (clip it a few inches below the knot). For everything else, it all depends on the type of clips the AV people have and whether there are actual AV pros there at all. Do your research or consult an AV professional (which I am NOT) if you can. This is a funny one. A friend recently reported feeling chagrined to discover that the outfit she was wearing for a speech was the same appearing in her conference program photo. I personally have given up worrying about this, as I happened to wear a favorite outfit in my headshots and I don’t have enough clothes to just stop wearing it for speeches! But if this is an issue for you, keep it in mind. Also, it’s one more good reason to dress in something basic and neutral — either for your headshot, on stage or both. 10. Take Off That Name Tag! If you’re speaking at a conference, you’ve probably been issued a great big laminated badge. Take it off before you speak. They’re ugly, the clip-on kind never stay straight, and they can wreak havoc with the stage lights. This is important, but so easy to forget, so I actually have “remove name tag” on my pre-presentation checklist. 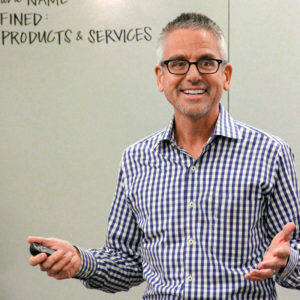 Off the top of my head I can list more than a dozen things more important to a presentation’s success than your choice of clothing: the power of your ideas, how clearly they’re structured, the energy and passion you bring to them, your connection to the audience, the way you move and gesture, and more. Compared to all that, figuring out what to wear for a presentation seems downright trivial. But an inappropriate outfit can handicap you from the start. And the right one can make a subtle but important difference in the way you feel and the authority you project. When it comes to presentations, the little things often add up to something big, so a few extra moments’ consideration — and some extra investment — should be well worth it.